It’s September! For a girl who’s allergic to chlorine, gets sick from open sun, and is enemy #1 to mosquitoes, you better believe I’m tickled all shades of autumn to welcome September’s transition into fall! 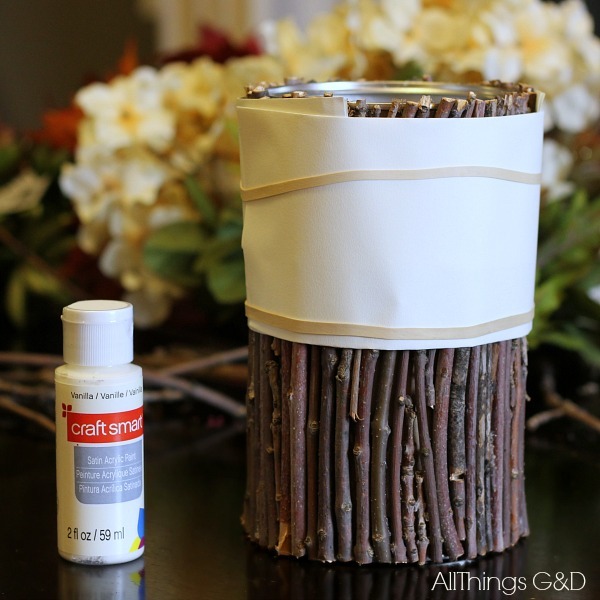 The tree in our front yard is already turning and dropping leaves, and I couldn’t resist snipping some branches to make this DIY Painted Twig Vase. Nothing says fall like brining a little bit of the rustic outdoors inside! 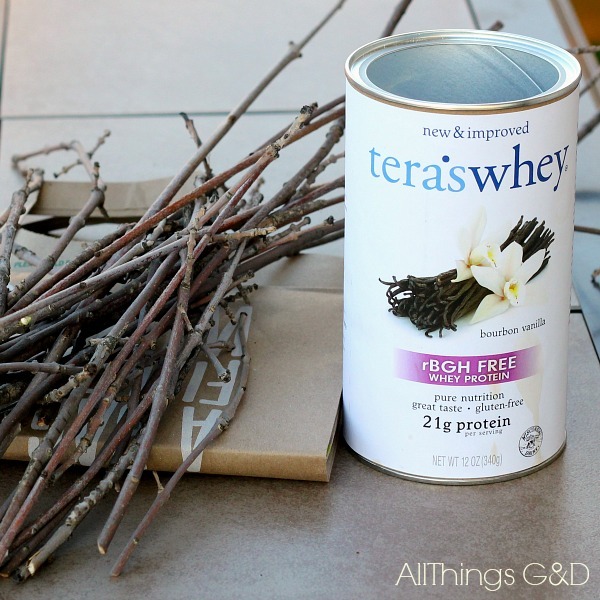 To get started, find your nearest tree and trim some branches. Straight ones are the easiest to work with, but I’ll admit I loved working with the curved ones and piecing it all together to fully cover my container. 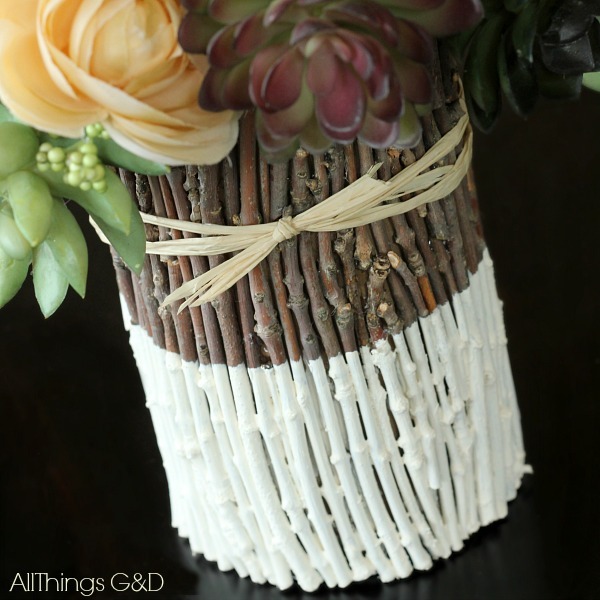 I used an empty canister as my vase, but you can use anything you’d like! A large tomato sauce or peaches can, or anything in the height and width that you’d like. 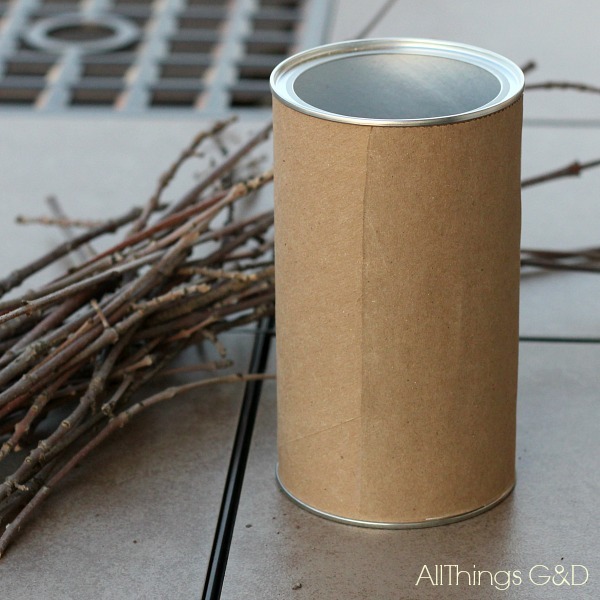 Wrap your canister with the unprinted side of a brown paper bag. This ensures that you won’t see any of the label through any of the gaps in the sticks. 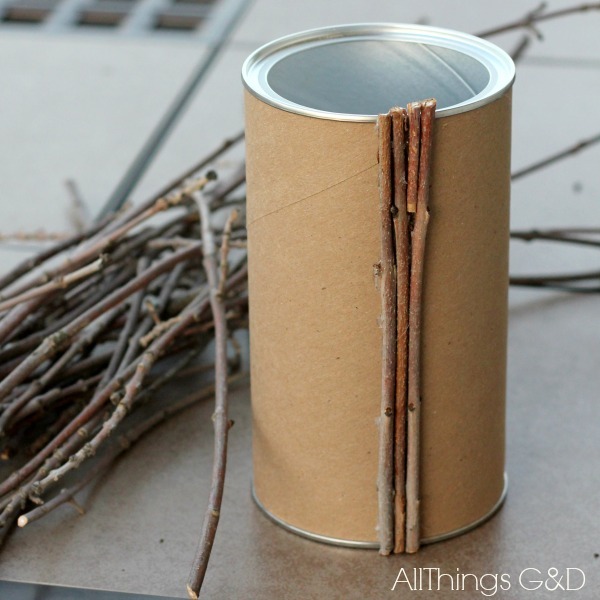 Cut or snap your twigs to the appropriate height and use a hot glue gun to glue to glue them to the canister. You may need to work with the sticks and piece things together to get it all to fit and be covered, but that’s all part of the fun! Here’s how mine looked fully covered in twigs. You could stop at this step and have a fabulous rustic vase, but I preferred to take things one step further. As my Instagram peeps already know, I got a killer blister from this glue gun doing this project. Totally worth it. I was worried that a painter’s tape line across the twigs would rip off some of the bark, so I folded a piece of paper, secured it with rubber bands, and used that as my painting line. I chose a vanilla colored craft paint, which costs about $1.50 at the craft store. 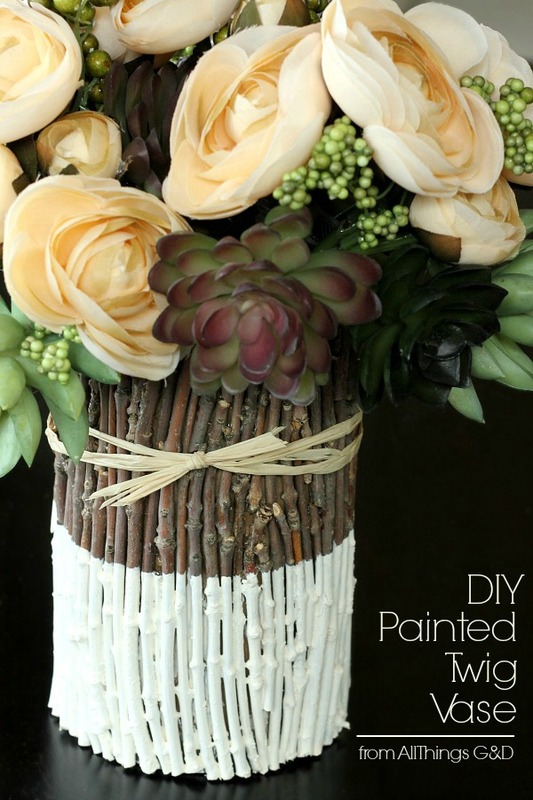 Let that dry, tie with a strand of raffia, fill with flowers, and enjoy! 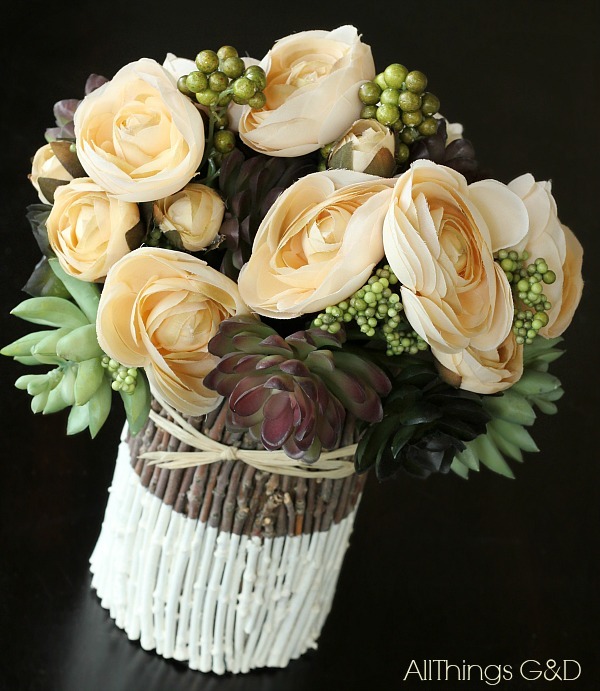 I typically prefer fresh flowers, but this faux rose and succulent arrangement that I found at Michael’s was too gorgeous to pass up. 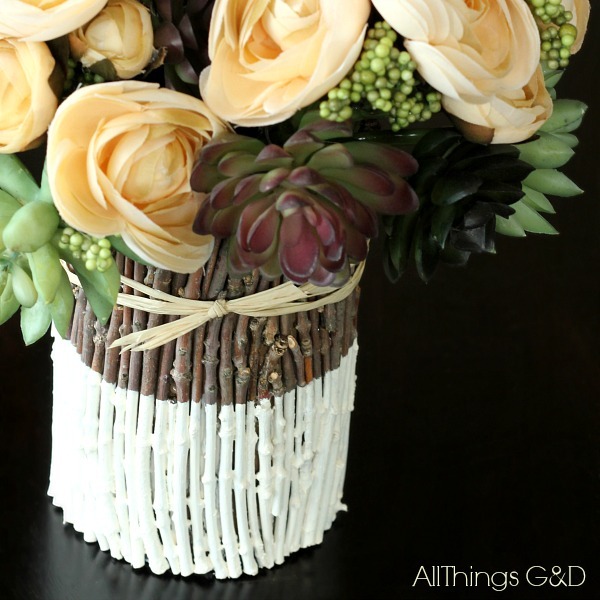 This foliage-filled arrangement will be on display in our home all fall (and winter) long! Like this post? 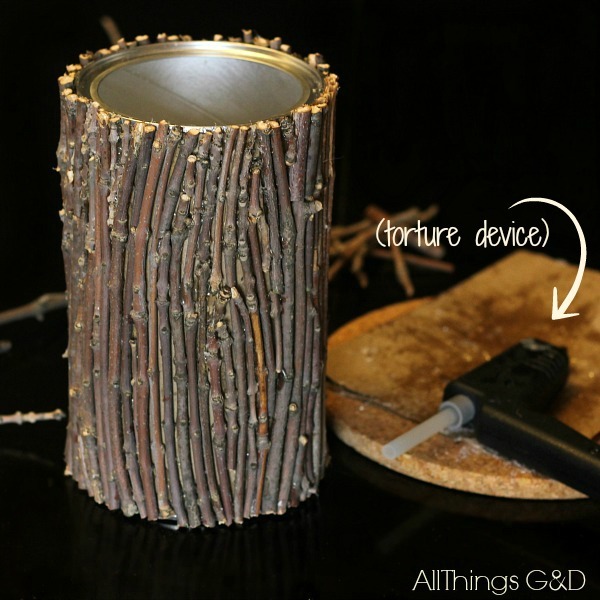 Check out my All Things G&D DIY Gallery! I love it! Such a simple idea, but so clever! I’m pinning and sharing on my FB page today. Thank you so much, Leslie! I appreciate the share! I love this Dusty! I’ve been looking for a specific size vase and this will be perfect! I’ll probably use a two-tone grey and white lacquer for a mod look. That would look gorgeous, Marcia – definitely your style! So fun! I hope yours turns out great! I love being able to bring a little outdoors inside, AND being able to keep a piece of the tree in our front yard even after we move! This is so pretty Dusty! You gave me a perfect solution to a vase issue I was having just this morning! Thanks for sharing. Pinning! I love hearing that, thank you Jeanie! I hope your vase issue is all resolved and looking fabulous! NOW THAT’S AWESOME!! Love makin use with what you got…nailed it!! Love it! And I love autumn! Can’t wait to try this. Thank you, Donna! I hope you do give it a try! It was time consuming, but not difficult. Super cute! Thanks for sharing the tutorial.